In June 2018 alone, more than 500 refugees drowned in the Mediterranean Sea. 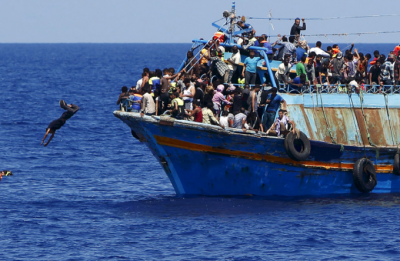 Their boats were refused access to land in either Malta, or Italy. They were force-driven back by gun-boats to the North African shores they came from, mostly Libya, but many boats capsized and countless refugees didn’t make it. The refugee death toll in the Med-Sea in 2017 was about 3,200, 40% down from 2016, and more than 600 up to end of April 2018, and another more than 500 in June. This figure is bound to increase drastically, given the European closed-border policy – and more. The EU is contracting among others, the Libyan Coast Guard with gun boats to chase refugee vessels back to the Libyan shores, many sink – and saving those thrown into the sea is ‘forbidden’ – they are simply left to die. That’s the rule. Malta, a little island-appendix to Brussels, but important as a refugee transit, has issued strict bans on private fishing boats and NGOs trying to rescue refugees. As a consequence, the by now well-known German NGO “Lifeline” boat with 234 rescued refugees and migrants on board from Africa and the Middle East – miserably poor, sick, desperate people – struggling for sheer survival, many with small kids, who wanted nothing more than their children to have a better life – was rejected by Malta, turned back into the sea, under guidance of NATO and EU hired military-type private contractor gun-boats. Eventually Portugal offered her safe shores for the refugees. Malta has a Partnership for Peace (PfP) Agreement with NATO, i.e. obeys NATO orders. NATO, a killer organization, has, of course, not a shred of humanity in its structure, nor in the blood of the people at its helm – anywhere in the world. Imagine – in this context, an EU summit took place at the end of June 2018 to “arrange” and agree on how to handle the refugee crisis in the future, in other swords, how to keep them out of Europe. None of the countries, other than Germany, were even considering accepting some of these poor souls out of sheer humanitarian reasons, to give them shelter, food and medication. The discussion even considered where to build a wall – yes, fences were discussed to keep them out – Europe a xenophobic free-port for the rich, acting in questions of migration as a carbon copy of Trump. They deserve each other, Trump and Brussels, trade wars not withstanding – let them shred each other to pieces.